We enjoy her products and tell her story, but never knew her condition was fatal or that she had passed. She truly left a beauty legacy that has improved lives. 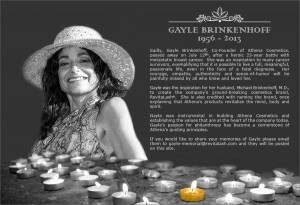 The GS HAIR family wishes to extend our deepest condolences to those close to her. May she rest in peace and shine down on us knowing that she made a difference in so many peoples lives. We are located at 2398 Fair Oaks Blvd. Ste 9, Sacramento, CA 95825. Book direct (916)838-4642 we text. E-mail us at gshair@sbcglobal.net We are in the modern building on the corner of Fair Oaks Blvd. and Fairgate Drive. #ontheboulevard See you at the studio!